Colorado Springs, CO - The Colorado Springs Switchbacks FC announced today the club has signed Clint Irwin & Kofi Opare on loan from the Colorado Rapids, pending USL Championship, MLS, and USSF approval. The duo will return to the Colorado Rapids immediately following Saturday's game. Irwin spent three seasons with the Colorado Rapids (2013-2015) before joining Toronto FC for the next three seasons (2016-2018) and playing a crucial role in TFC's 2016 playoff run. 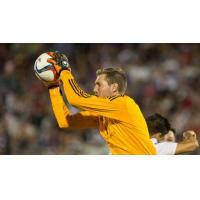 The experienced goalkeeper joined Colorado again in December after playing 121 games in Major League Soccer. Opare joined the Colorado Rapids in February after spending five seasons at D.C. United where he made 62 starts in 65 appearances, scoring three goals and adding an assist. In addition to these moves, Andre Rawls has been recalled by the Colorado Rapids.